Over the last few decades, health problems in children have increased tremendously – diabetes, eczema, autism, asthma, obesity, hypertension…the list goes on and on. While there could be many reasons for this, some experts hold the change in family lifestyle to blame. Parenting hasn’t ever been an easy job, but over the last 30 years things have changed tremendously. Not only are we less active during the day, we find that not all families are capable of having a parent at home during the day, managing the household duties. So we struggle to fit in health exams, dental exams, homework, school runs, extracurricular activities, work, cleaning, laundry and food. To help us manage our time, we look for options that will help us avoid the dreaded schedule conflict. We exercise carpool options for school and extracurricular activities for our kids so we only have to make the drive every few weeks or so. We buy larger load washing machines. We buy cleaning products or tools that make cleaning faster and easier. And we buy fast food when we’re crunched for time or on the go. While the topic is often controversial, there are certain things that can’t be denied, one of those being the effects of fast food on our health and the health of our children. Health experts, public officials and studies have warned that overconsumption of fast food can lead to a number of health complications, including obesity and heart disease. A new study has found potential evidence that links fast food to yet another set of complications – and they have nothing to do with weight. Previously research found that the benefits of asthma prevention provided to babies by breastfeeding are cancelled out by eating fast food just once or twice a week. This study prompted more research from another set of researchers who theorized that the fast food diet epidemic may be partially responsible for the increase in certain health conditions like asthma, hayfever and eczema. To test their theory, researchers looked at the diet of more than 319,000 thirteen to fourteen year olds from 51 countries and over 181,000 six to seven-year-olds from 31 different countries. Said to be the largest study of its kind, the study asked the teens and parents of younger children (all of which were enrolled in the International Study of Asthma and Allergies in Childhood (ISAAC)) about the frequency of their fast food consumption. Foods like butter, margarine, rice, pulses, nuts, milk, eggs, fish, meat, vegetables, fruit, bread and pasta were also on the food questionnaire. All of these foods have been linked by previous studies to either protective or damaging effects on health, and all of the food items were classified as never, occasionally, once or twice a week, or three times or more a week. Along with the information on food consumption, researchers gathered data on the prevalence of asthma (wheezing), eczema and rhinoconjunctivitis (runny or blocked nose with itchy, watery eyes) in the children and teens. Symptoms were checked over the following year through questionnaires, and parents were asked to share whether or not the symptoms interfered with daily life or sleep. After gathering all of the data, the only food that seemed to have the same link across both age groups was the fast food. 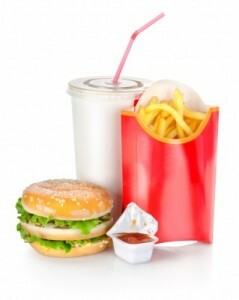 Teens that consumed fast food were found to have both current and severe symptoms of all 3 conditions, regardless of their gender, country or level of affluence. This was less true when looking at teens from poorer countries and younger children. Researchers deduced that this decreased prevalence may have had more to do with having fewer food choices than anything else. In addition to the mild symptoms, teens were found to be at a 39% elevated risk for severe asthma when they consumed fast food three times or more a week. Younger children, while at a slightly lower risk than teens for this very same problem when consuming fast food three or more times a week, were still at an elevated risk when compared to those that did not consume fast food as much – a 27% higher risk. “If the associations between fast foods and the symptom prevalence of asthma, rhinoconjunctivitis and eczema is casual, then the findings have major public health significance owing to the rising consumption of fast foods globally,” researchers said in the medical journal, Thorax. Interestingly enough, it seems that there is a way to reduce the risk. Children who consumed fruit three or more times a week had a reduction in the severity of their symptoms. Symptom reduction odds were found to be 14% for younger children and 11% for teens. The research team pointed out that there could be several reasons why the data came out the way it did. For instance, the high levels of saturated and trans fatty acids in fast foods could decrease the body’s immune system, but fruits, which contain beneficial compounds and antioxidants, help improve the body’s immunity. Overall, the study did not prove a cause and effect relationship and more research will be needed. However, the data may be strong enough to make parents think twice before grabbing take-out food tonight. Or, at the very least, to get them to examine some possible options for making meals at home healthier – even if it is just adding some fresh fruit to their children’s diet during the day.